The ship paused on its trek a couple of days ago to take care of some solemn business. When we departed Pearl, we were entrusted with the cremated remains of thirteen brothers-in-arms to be committed to the deep. Small ships have no facilities to store casketed remains, but the larger ships frequently accept them for burial. Most Americans - and even many veterans - don’t realize that any honorably discharged veteran of any of the armed forces is entitled to a burial at sea if they or their loved ones choose. Indeed, the majority of services I’ve been involved with haven’t been veterans of the Navy. Perhaps they had some connection with or love of the sea, or perhaps it was the best option for the serviceman’s survivors. Just over a score of volunteers perform the ceremonies aboard RUSSELL, and they’re well practiced. It all starts with the ship lying to and passing the word, “All hands prepare to bury the dead.” The remains and the ceremonial flag are marched through an honor guard to the front and center. One of the ship’s lay leaders, or a chaplain when one’s available, reads a psalm, Scriptures and a prayer. The remains are marched to the deck edge and presented to the officer who will scatter them as the honor guard fires three volleys and the Boatswain Mate of the Watch plays taps over the ship’s announcing system. 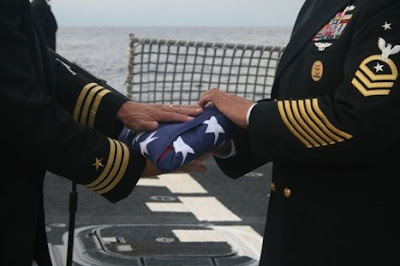 The flag is then received by the Command Master Chief as the leader of the burial at sea detail, who then presents it to the Commanding Officer as the representative of the family. 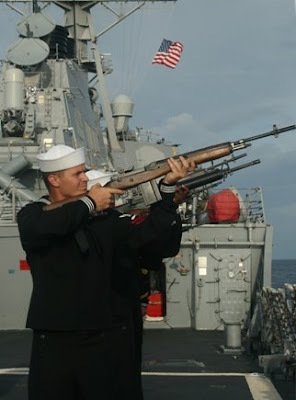 All of this gets recorded on a DVD and returned to the family with the flag, 21 spent casings and a chartlet that marks the location of the service. I recall performing burials at sea long ago when I was an Ensign, but it seems like there has been a dramatic increase in the numbers in the last few years. Perhaps that’s because the veterans of the Second World War are beginning to leave us. And with them go much of our history. It's a great thing to do veterans this honour. Yes, that history is going with them. Just 20-odd years ago, when I was a child, it was still common to see First World War veterans on parade and living among us. Now almost all of them are gone, and even the Second World War vets are leaving us these days. But we shall remember them. It is fitting for the "greatest generation" to be buried by the "Next Greatest Generation". 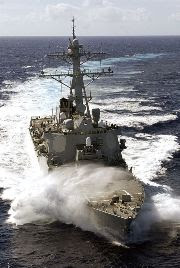 May they rest easy upon the sea and have nothing but "Fair Winds and Following Seas!" Rest in Peace my brothers. Thanks so much for this post. I wasn't aware that any veteran had the option of burial at sea. It's certainly something to consider. I can think of no better ceremony than the one you describe. To be committed to the deep by your representatives would be an honor. Thank you for your Patriotism and Honor. What an honor it would be to take part in a ceremony like that. I truly admire and envy you all for the awesome and important work you all do! Although, it must be extremely difficult at times both physically and emotionally. Must be an honor to take part in it and a comforting and emotional moment for the families. Thanks for the nice description. A wonderful post! I remember being a young seaman inland, and having the honor to bury a number of Vietnam casualties (usually Riverine Navy). The funerals were solemn, and very moving. But sea services are special - a time-honored way to inter our servicemen in the element they alternately loved, and perhaps feared.